This Friday, BBC2 is showing a documentary called Isaac Newton: The Last Magician as part of a new series on The People Behind The Inventions. Issac Newton was one of Britain's greatest scientists, as information about the programme on the BBC website says: "Newton forged his own path through the scientific revolution of the 17th century. He invented calculus, discovered the composition of light and revolutionised what we now call physics with his Universal Law of Gravity." But as well as being a scientific genius, Isaac Newton was a magician. The BBC website goes on to explain: "This master of the Age of Reason had a hidden passion that dominated his life – the search for God through the study of ancient texts, heretical religion and the occult study of alchemy. He risked expulsion from society, even imprisonment in his hidden quest to understand the very structure of the universe." Isaac Newton's interest in magic and alchemy is often overlooked by mainstream studies of the man, so those with an interest in occult history will be delighted that this aspect of his life is getting an airing on TV. Anyone who has read the Rivers of London series of fantasy novels will already be well aware of this bit of arcane knowledge, as the main characters in the books are students of Newtonian magic. Looking on Amazon, there's another book about Isaac Newton that could interesting. It is called Isaac Newton: The Last Sorcerer. 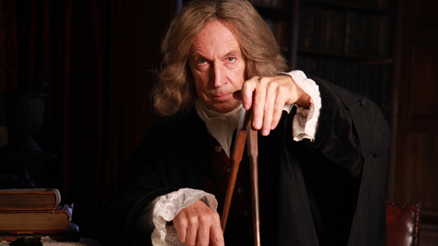 The BBC Two history programme, which is due to be shown on Friday April 12 at 9pm, combines interviews with experts and dramatised interviews based on the words of Isaac Newton and his contemporaries. Meanwhile, for those who want to know more about the history and science of alchemy, there is currently an exhibition about it on at the Science Museum, in London. It is called Signs, Symbols, Secrets. As both a Physicist and a Magician, I would love to watch this program. I hope it comes on BBC America sometime soon. F = M x A!!!! Maybe it will be shown on US TV some time.